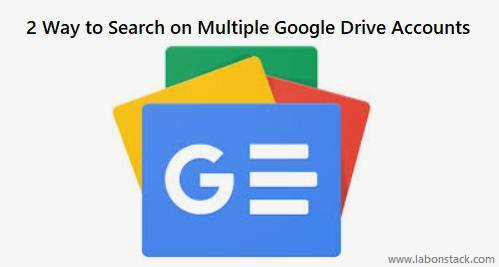 In this article, I have explained how we can search on multiple Google Drive accounts. We know Google Drive comes with the best feature where you can find al the type of files and files types. But In Google Drive still, now there is no option to search files from multiple Google Drive accounts together. I have written this article for those who want to search from multiple accounts. All the basic thing is the same in all these methods. Here I have listed two methods to search files in multiple Google Drive accounts together. To use this tips you need to create a free account and login with your all the Google Drive accounts to connect those accounts and allow the service to access your Google Drive account. Multiple Cloud Storage Manager – Manage All Cloud Storage in One Place. FREE App for Sync, Backup and Transfer Files between Cloud Storage. This is one of my favorite methods to search multiple Google Drive accounts. MultCloud is a very popular service. It lets you add Google Drive accounts for regular users. You can set the custom name for each Google Drive account to easily identify. Transfer files among multi-clouds, FTP and WebDAV for easy file management and information delivery. Steps 1: Connect All the Google Drive Account from that you want to search. Select “Quick Search” as Search Type. Select Drives where you want to perform the search. Step 3: Now Enter search keywords or search text, and Press the “Search” button. Above steps will show you files and folders related to search text in all of those Google Drives. For every search result, you will be able to check the file name, location, modified date, and item size. For every search result, you will be able to check the file name, location, modified date, and item size. MultCloud has many other features as you can syncs two clouds or directories in two cloud accounts. Multcloud can manage multiple cloud storage accounts like in Windows Explorer, including upload, download, delete, rename, preview cloud files. Method 2: Share all the files and folders from the accounts that hold the files with the account that you want to use for searching. Step 1: First you need to select one of your accounts as the “master account”. Step 2: Create a folder to be used as a “Master Archive” in your “master account” and share it with editor access to your other account. Now you can find that sharing files and folder from another account that have access to that files. So here I have shown you two very good options to search multiple Google Drive accounts. But there are many other similar services that let you search multiple cloud storage services. This two method is best because they provide the extra feature, which is to search files in multiple Google Drive accounts.